Dumb. Dumb. Dumb. There is no other word that so aptly describes Sony Pictures’ new action thriller Olympus Has Fallen. There is little to nothing redeeming about this roughly two-hour turn-off-your-brain action flick. From the moment this forgettable travesty starts, it is so rife with problems that it’s nearly impossible to know where exactly to start. Perhaps the best place to start would be from the beginning. So let’s begin from the beginning. Gerard Butler’s moody Mike Banning is the all too stereotypical anti-hero who is haunted by the past and trying to make amends for something for which he blames himself. Of course, when everyone else is killed by a Korean paramilitary group in a surprise attack, Banning is the only one that can come in and save the day. Of course. On top of that, he is having relationship issues with his girlfriend, too. Sound familiar yet? It should. This just sounds like an updated take of the one true action classic, Die Hard. The only difference is that instead of being set in Los Angeles, this one is set inside the White House with a few other minor changes. The general lack of originality isn’t the only problem from which this movie suffers. As noted, there is also a major issue with the story’s plot holes, which begin from early on. How exactly a foreign paramilitary group managed to get their hands on fully armed and equipped C-130 Hercules is never explained at any one point in the story. That’s just the beginning of the problems. Writers Creighton Rothenberger and Katrin Benedikt never fully give any background on how the paramilitary group managed to infiltrate a group of South Korean diplomats, either. The only background that’s given is on the group’s leader late in the story. Here audiences get yet another massive plot hole. It is at least revealed that he’s a South Korean who held a grudge against America for the death of his mother when he was a child. But even that is a problem. Yet again, audiences get another clichéd story element. The leader of the bad guys is a madman out for revenge for something that happened when he was a child. This has been done to death. And now it’s been buried with its use here. These are rather key issues that seriously hurt this story. At least the pair took the time to explain the group’s motivations. That’s about all that can be said in their defense, though. That being the case, it only gets worse from there. It gets worse thanks to the references to 9/11. At the time that Olympus Has Fallen premiered, America was nearly twelve years removed from the tragedy of September 11th, 2001. But for so many families across the country, that horrible day was still fresh in their minds. That being the case, it could very easily be argued that having a giant, fully armed C-130 fly over the nation’s capital mowing down innocent civilians was little more than a pair of writers capitalizing on a national tragedy. And that is just abhorrent. It’s one thing to have a group of bad guys taking on Americans and Americans winning. But to touch on a nerve that is still so sensitive to this day is entirely thoughtless. It’s not the end of the movie’s problems, either. Olympus Has Fallen has so many problems that it drowns in them. It only gets worse. In their attempts to make up for all of the problems that plague this movie, Rothenberger and Benedikt have front loaded it with more than enough over the top explosions and blood shed to make any college frat boy scream with delight like a little schoolgirl. It’s the finishing touch on a movie that hardly lives up to the standard set by much better action flicks that have come before. 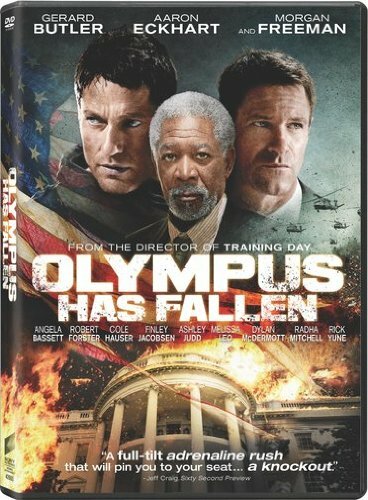 All things considered, Olympus Has Fallen has made itself one of the worst action flicks of 2013 and one of the worst movies of the year, too. This entry was posted in Celebrities, DvD's and blu-rays, Internet, Movies and tagged Aaron Eckhart, celebrities, entertainment, facebook, Gerard Butler, internet, Morgan Freeman, movies, Olympus Has Fallen, Phils Picks, Sony PIctures, Sony Pictures Home Entertainment, Wordpress by philspicks. Bookmark the permalink.